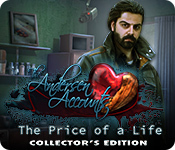 The "The Andersen Accounts: The Price of a Life Collector's Edition " is a puzzle game.It's rank is 22.Provided by the BigFishGames.This game includes This city never sleeps...,Team up with Chris Andersen, the Hero of Rat Tower, and the clever kid cohort to collect evidence of Reynard’s crime syndicate! Help Rat Tower residents get rid of Reynard – permanently!,Replay your favorite HOPs and mini-games - and earn achievements along the way!,Search for tons of graffiti-themed collectibles, animal souvenirs, and morphing items! Then check them out in the Souvenir Room and a Rat Tower alley!,Don’t miss the exclusive wallpapers, music, concept art, and more! Save your favorites!,Keep your investigation on track with the strategy guide!, If you have a question about install the game,then please check our FAQs.